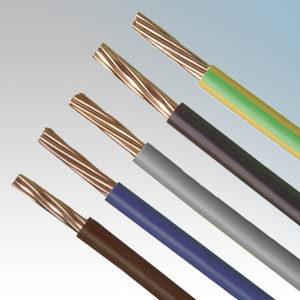 PVC insulated single core, low voltage copper wiring cable manufactured for installation within enclosed, protected environments. Particularly suitable for wiring systems this PVC cable is easily drawn into conduit and trunking used for lighting and power circuits indoors or outdoors. stranded plain annealed copper wire (class 1 or class 2) to BS EN 60228.